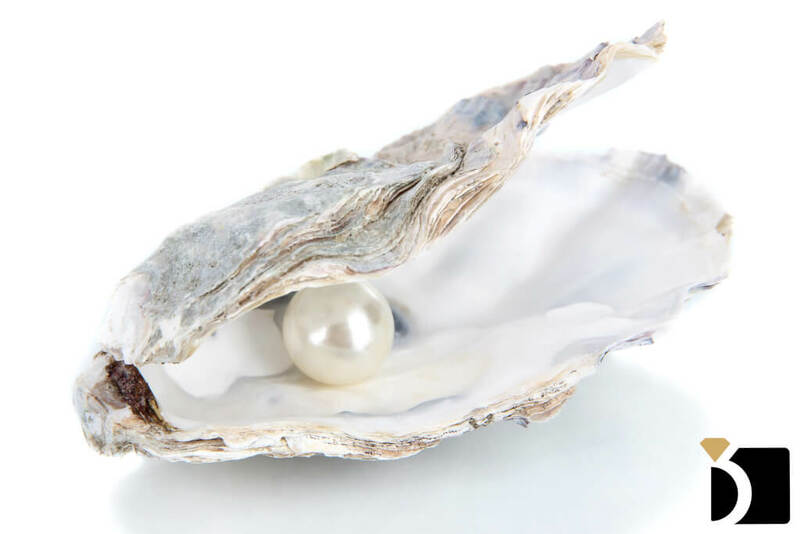 A pearl starts as a foreign particle (a pebble, shell , or sand) in an oyster or mollusk. The particle irritates the mollusk and it secretes a substance called nacre. The nacre protects the mollusk from the particle. Over the years, layers upon layers of nacre adhere to the particle, which results in a pearl. Natural pearls are very rare and extremely expensive, found mostly in the Persian Gulf. Only one oyster in forty may contain a pearl. A natural pearl is created in the oyster by chance. Cultured pearls were developed as a response to the extreme rarity of naturally formed pearls. By seeding an oyster with an irritant, layer upon layer of nacre forms until a lustrous cultured pearl is created. Cultured pearls are frequently bleached and polished for uniform color and shape. Some cultured pearls are dyed or irradiated to achieve to change or enhance the color. The 2 most common types of pearls are Akoya Cultured Pearls and Freshwater Cultured Pearls. •	Akoya Cultured Pearls are cultured in saltwater. Japan is known to produce the highest quality Akoya cultured pearls. They tend to be more expensive than Freshwater cultured pearls since they are less available. •	Freshwater Cultured Pearls are cultured in rivers and lakes primarily in China, They are less expensive than the Akoya cultured pearls since they are more readily available. The closer a pearl comes to being perfect in these characteristics, the more valuable the pearl. •	and the most traditional styles of pearl jewelry are the classic Pearl Strand and Pearl Stud Earrings. Proper care for your pearls is very important since they are an organic gemstone that is vulnerable to acid, alkaline and extremes of humidity. To protect your pearls and preserve their luster, avoid contact with cosmetics, hair spray, or perfume. Always put on your pearls as a final touch, after applying cosmetics, perfumes, and hair spray. Pearls can also be damaged by perspiration, so always wipe them with a soft damp cloth before storing them. Pearls also have a soft surface, and can easily be scratched. Store them away from other jewelry and use a protective jewelry pouch when carrying them. Pearl strands should be restrung as part of the basic care and maintenance, the frequency depends on how often they are worn. If you would like information on our pearl jewelry services, please click here. Or if you're ready to begin a repair, click on the get started button below!